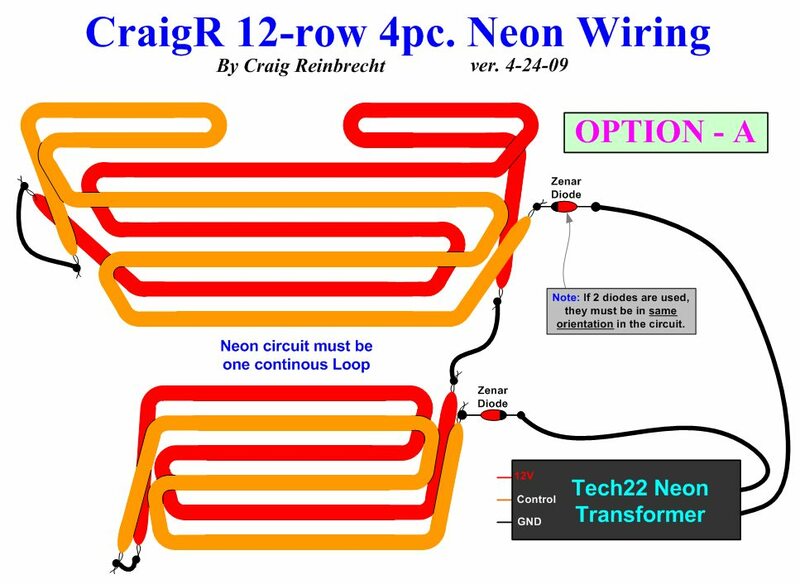 New & Updated Neon Wiring Instructions - By Adam S, David S, and Craig R.
As it has been for years the Tech22 Music Interface and Neon Transformer is still the highly recommended solution for powering and triggering our B9 Neon. But it is very important to note, they have made some changes to their devices in recent years. Sometime in 2011 the Tech22 Music Interface was improved and now has more wires than the old version. The new version is fundamentally different from the old version, and you no longer need the TIP31 Transistor to make it work properly. 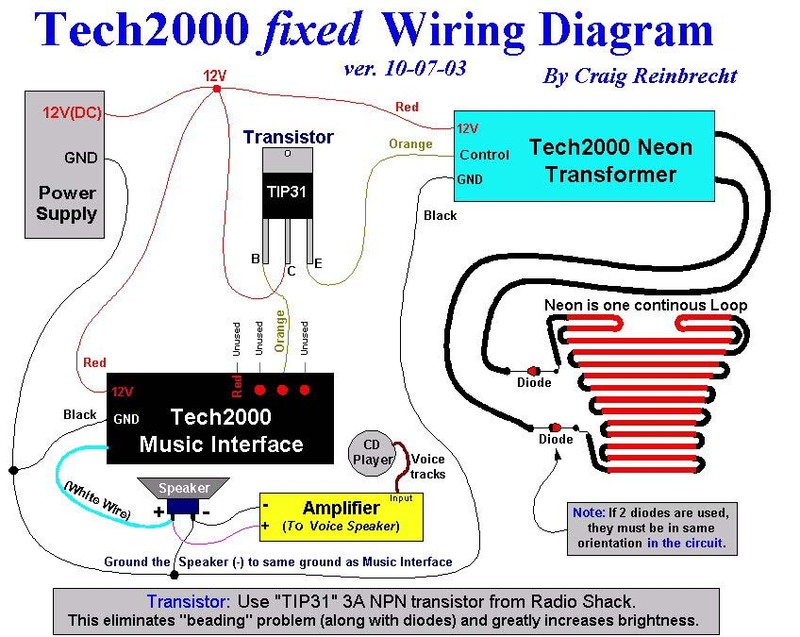 This also makes the old Craig R. wiring diagrams obsolete (unless you have the older version Music Interface). 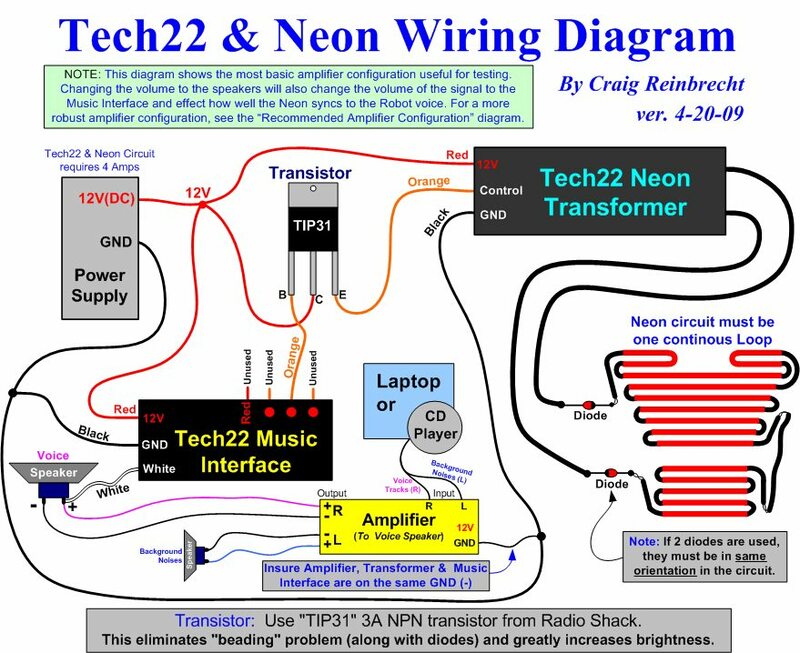 The new Tech22 Wiring Diagram that comes with the Music Interface (See modified below) shows a box marked SIGNAL INVERTER. Please note this part is in an unmarked bag and it looks like four bits of wire that are soldered together under a little bit of shrink-wrap. So beware! It is very easy to overlook this tiny bit of shrink-wrapped wires, but this is the Signal Inverter, and crucial to our B9 Robot wiring! Connect the four wires of the Signal invertor into the circuit as per their diagram, and test your setup. It should work, but you may need to adjust the Music Interface. You can adjust the sensitivity of the Music Interface and you will find that you only have to turn the knob a little to have a BIG effect on when it switches. This is a scan of the diagram from Tech 22, modified to show the B9 Robot Neon. Using only the yellow wire on the music interface as the signal to the transformer seems to work best for the B9 voice and is recommended. 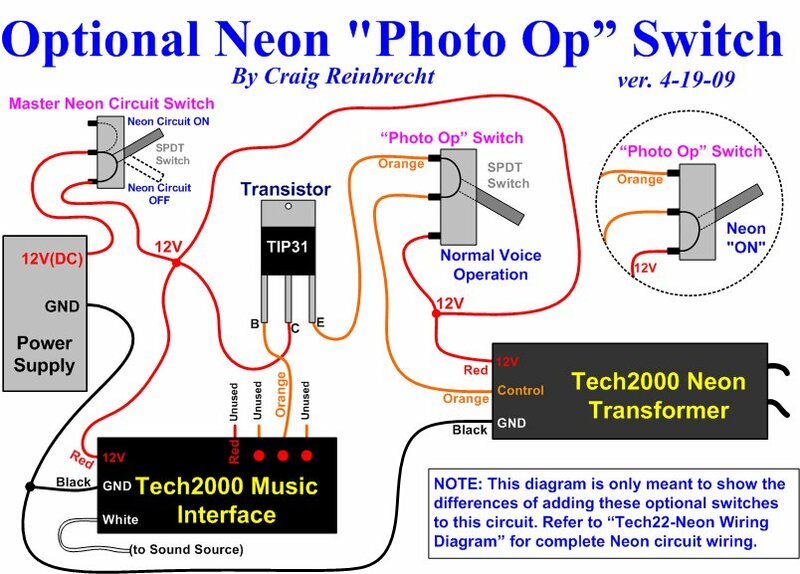 New & Updated wiring diagrams - By Craig R.
Lighting the neon and syncing it to the robot's voice is not hard, as long as you have a good device to do it with. The Tech22 model 8000 neon transformer and music interface, are an excellent 12 Volt solution to lighting and syncing the neon. You can contact Tech22 directly: (760) 431-7144. Tell them you need the transformer and music interface for the robot neon, and they will know exactly what you need and they will also include the needed diodes. It is the Model 8000, 12V unit. The Tech22 music interface works VERY well to sync to the robot's voice, but it does require an amplified sound source. Hooking it directly from a portable CD earphone jack will not work, it must go through some type of amplifier to increase the signal. I used the amplifier from a cheap pair of computer speakers for this purpose. I kept it separate from the audio amplifier I use for my robot speakers. The Tech22 setup does have a few problems, but they are fairly easy to overcome. Without any fixes, the neon will show a "beading" effect when lit. The glowing neon actually looks like beads from a necklace. This can be corrected by adding one or two Zener diodes, which Tech2000 will supply. Also, the music interface puts out a weak signal that doesn't fully turn on the neon to its maximum brightness which also adds to the beading problem. That can be easily fixed by adding a transistor to boast the output of the music interface so it supplies 12V to the transformer control input. 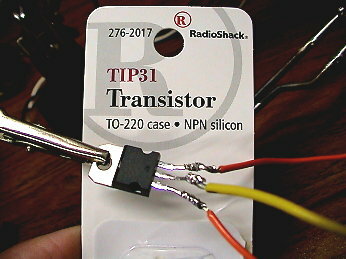 Use a "TIP31" NPN transistor from Radio Shack, only $1.29. That fix works great and the neon will now light very bright without any beading! Setup the neon and electronic parts on a table before installing it in your robot, and test everything before soldering. 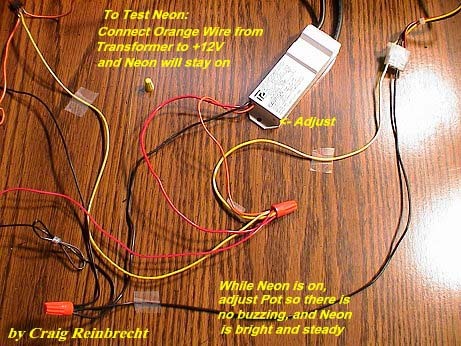 In order to light the neon for testing without an audio source, you can temporarily jumper the CONTROL input (Orange wire) on the TRANSFORMER to 12V (Don't connect the music interface orange wire output to 12V!!) Now the neon should be lit, and you may see the "beading" problem. The diodes can go anywhere in the high-voltage circuit, and you should experiment with putting the diode or diodes in different places in the circuit. Find the combination that works best to eliminate the beading. If two diodes are used, they must go in the same orientation. In other words, the diodes must face the same direction when you follow the circuit loop around. The neon circuit should be one big loop, there is no positive or negative side. Hook up the audio source to the music interface and test the whole setup. 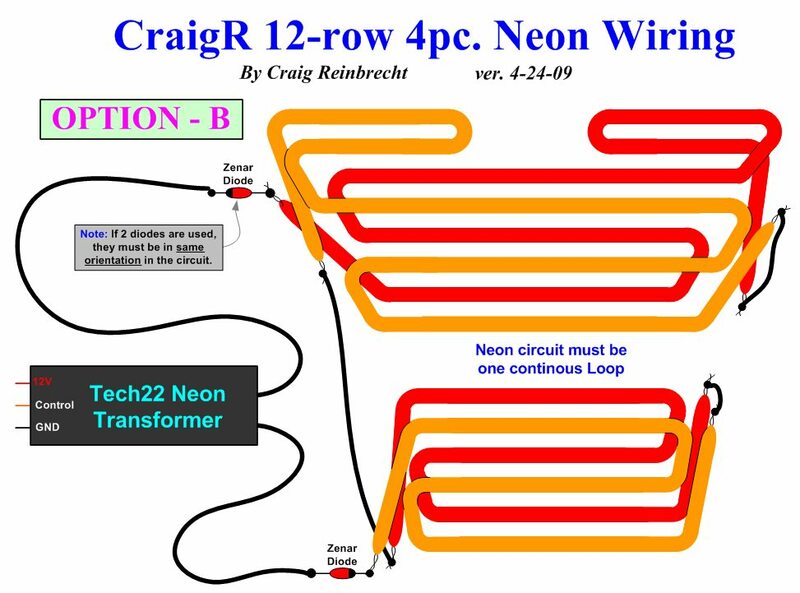 While testing my new 16-row neon with the Tech22 transformer and music interface, I discovered a possible problem with my "Tech22 Fixed Wiring Diagram" that is currently posted on the B9Helpers web site. I discovered that you must ground the negative (-) side of the speaker or amplified sound source to the same ground as the music interface. 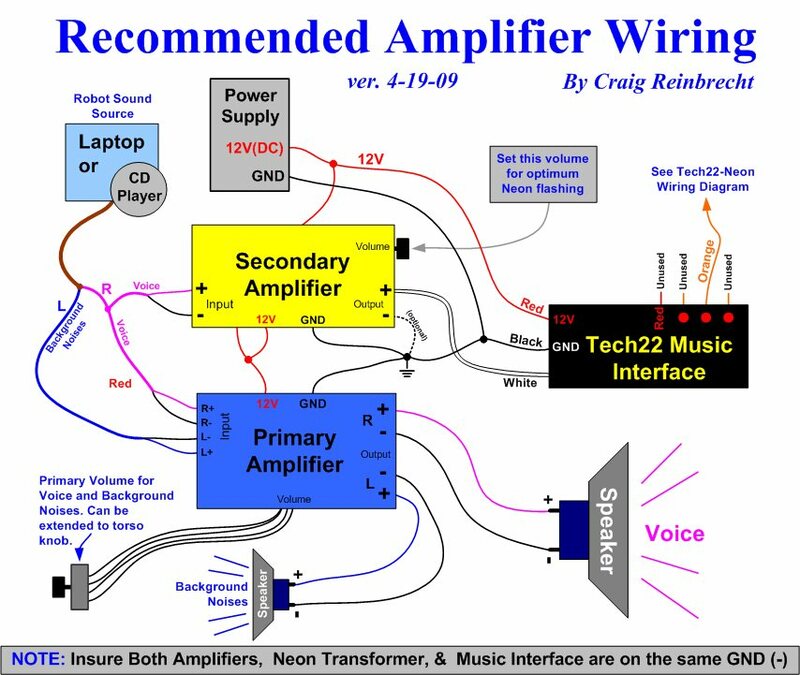 That ground may not be needed if you are powering both the amplifier and music interface from the same power supply, which is how my robot is wired and why I omitted that from my diagram. The problem shows up, however if they sound source and music interfaces are on separate power sources. The grounds may be floating and the music interface will never sync correctly to the voice, no matter how much volume you give it. At the same time I discovered this, I found out Thomas Amo was having this exact problem, and grounding the (-) side of the voice speaker to the same ground as the music interface fixed his problem. 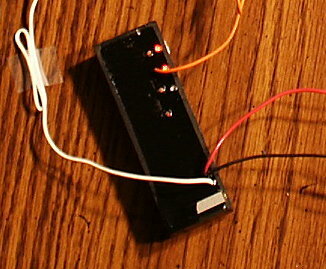 A good first test for the neon and transformer, before you try to sync it with the voice, is to turn it on steady by connecting the Orange wire coming out of the Transformer (NOT the music interface!!) directly to +12V. 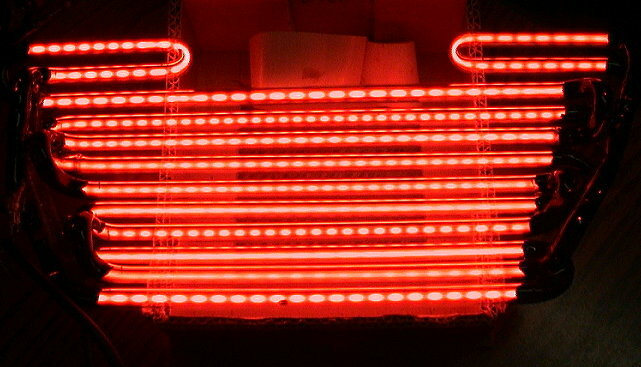 So, with the neon hooked up to the large black wires, and the small black wire connected to ground, and the red AND orange wires connected to +12V, the neon should light nice and bright. Also at this point you can adjust the adjustment pot on the transformer. I've found when it is not adjusted properly, the transformer will "buzz". 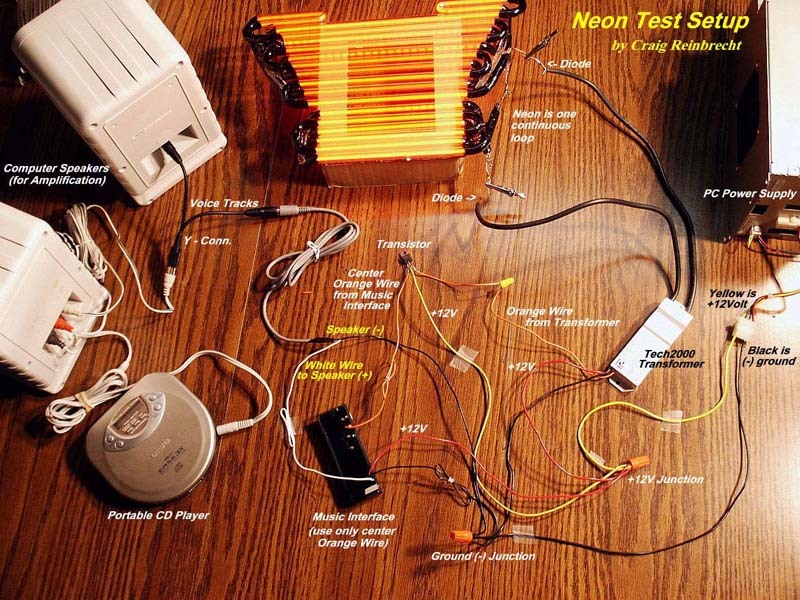 Here's a picture that shows the test setup: Neon Bench Test 2. I know I wrote a book here, but I hope it was helpful! Some people have received a version of the Tech22 Transformer that has BROWN wire along with the orange, red and black (plus the two large black neon wires, of course). This type of Transformer is the wrong type for our application. If you get this type of transformer from Tech22, send it back and request the type with NO brown wire. I talked with Tech22, and they know which type of transformer we should get, so if you get the brown wire version, it was a mistake. I must also note, it is probably better to ask for technical assistance from your fellow builders on the list rather than from Tech22. They do not understand our unique application of their products as well as we do, and you will get more relevant assistance from the B9 Builders Club. When you call to order, the Tech22 people are very nice, and very helpful. You will be pleased when they know exactly what you need!